A picket fence is seen by many as an ideal English symbol of a bygone era. 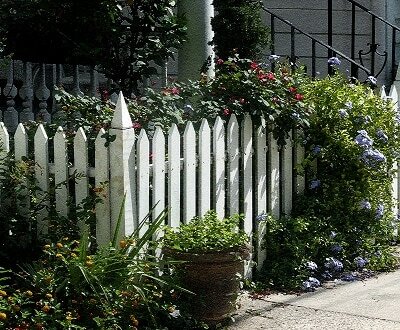 Whether you consider them quaint or kitsch, picket fences always add something to your garden. Uniform, evenly spaced, neat fencing demarking your front or back garden, beloved of those who love the suburban life and bringing a certain style to the neighbourhood. Your picket fence may be rustic to suit a more rural setting or painted white for a neat town or country look. The great thing about an English garden is that it can suit the individual. Some prefer regimented, paved areas, others like grass. Some like solid wooden fences to give privacy whilst others like to show off their gardens with a see-through fence, whilst still demarking their boundary. A picket fence is the perfect choice for a swimming pool if you want to keep children and pets safe whilst preserving the open look of the pool. Or fence off a child’s play area with a sandpit if you want to keep pets away. You can even use a neat picket fence to screen off areas you’d like to keep hidden. The options are endless and your picket fence will always add charm to your garden. “An Englishman’s home is his castle” – so goes the saying and we all reserve the right to design our gardens to suit ourselves, or just let nature take over if we prefer. Whatever we choose, it’s our prerogative! So whether you’d like a solid fence, chain link or a lovely white picket fence installed, provided it’s within planning regulations, we’re happy to fulfil your dreams and build the perfect fence for your setting. Call Horsham Fence Contractors for professional fencing installation throughout West Sussex on 01403 540132 to discuss exactly how you’d like your fences to look and we’ll be pleased to give you our best price.